Z-Cars 'Star Special' book on the BBC TV Police series from the 1960s-1970s. Homepage. This page: A look behind the scenes of this once-popular TV series, dating to the early 1960s. Anyone growing up in the 1960s or early 1970s in the UK, at least those who were fortunate enough to have their own television, will no doubt remember Z-Cars, a BBC TV series that ran from 1962 through to 1978. Although a fictional drama, the storylines were loosely based on real-world events. The list of actors and actresses who starred in episodes over the years is both varied and extensive, but when it comes to the four-wheeled stars of Z-Cars, only one car stands out - the Ford Zephyr Mk3. 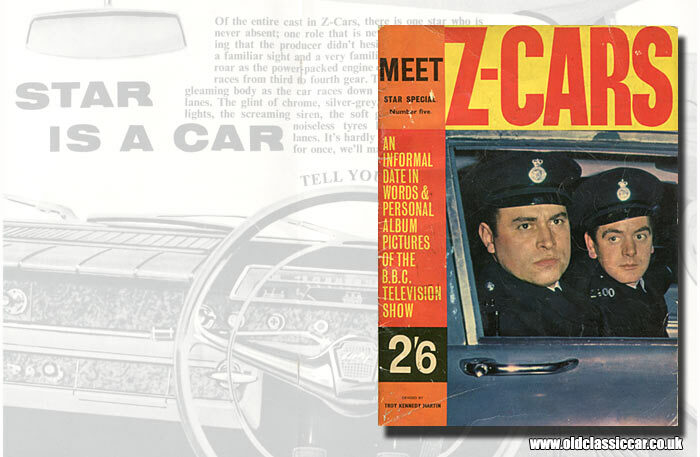 The cover of this "Meet Z-Cars Star Special" features two officers of the law, sat in just such a Ford. Although yet to be attached to his now trademark beard, the driver shown on the cover is Brian Blessed, in his role as PC "Fancy" Smith aka Z-Victor One, his callsign. This softback book was published in 1963 - ie just one year into the series' existence - by Troy Kennedy Martin and World Distributors (Manchester) Ltd, the latter being re-named to World International Ltd at the beginning of the 1980s and which had wound up altogether by the end of the same decade. Martin, the screenwriter of Z-Cars, died in 2009. His other claim to fame with regard to motors and the big or small screen, is that he wrote the 1969 version of The Italian Job. Wheras that film starred the products of BMC, Fiat and Jaguar to name just a few of the marques featured, Z-Cars of the early/mid 1960s instead brought fame to the be-finned Zephyrs being churned out at Dagenham in the period. The album's main aim is to shed light on the key actors that appeared in episodes of Z-Cars at the time, and uncover some of the behind-the-scenes activities that took place during filming. First though is an overview of how writer Troy Kennedy Martin, assisted by brother Ian, came up with the inspiration for this long-running series. Set in the fictional town of Newtown, the writers sought the experiences of real-world bobbies patrolling the streets of both Liverpool and Kirbky New Town, and I think they found plenty of material to work with. Then as now, many of the troublemakers were juniors out to cause mischief. One particular yobbo mentioned in the book, aged about fourteen, was caught stood on the top of a bus shelter aiming a twelve-bore shotgun at a nearby flat's windows. Eighteen of his equally undesirable mates were beneath him, in the shelter. Amazingly, when confronted about this un-sociable activity, he produced a firearms licence which covered him for ownership and use of a shotgun apparently. The authorities couldn't touch him, at least not until he decided to pull the trigger and create some inner-city bedlam. On another occasion, one of the writers accompanied the boys in blue to a street where several homes had had their electricity meters raided, and their contents stolen. A carving knife found on the floor of one residence was apparently this group of thirteen-year-old thugs' insurance policy, in case anyone tried to interfere with their nefarious activities. All jolly unpleasant stuff, but perfect material to enable the Z-Cars writers to pen stories that bore relation to the real-world. Portraits of some of the series' best-remembered faces then follow - Colin Welland, James Ellis, Brian Blessed and Joseph Brady - hotly pursued by an article that looks at the creation of each episode. Production and airing each episode. Originally the plan had been to produce just a single one-hour drama/documentary, but the response to it was so overwhelming that it didn't take long for a series to be commissioned. While the show was aired from Television Centre in Shepherd's Bush in London, Liverpool was visited to enable the filming of key outdoor scenes. Planning for each episode took place away from Television Centre, with the crew descending en-masse to the studio two days before the episode was to be transmitted in order that the sets - often as many as thirty - could be built within the studio. Each episode would be beamed out to television sets the length and breadth of the country, interspersed with pre-recorded location film footage as required. The actors and their cars. "Of the entire cast in Z-Cars, there is one star who is never absent; one role that is never altered; one casting that the producer didn't hesitate in selecting. It's a familiar sight and a very familiar sound... a throaty roar as the power-packed engine of the new Zephyr Six races from third to fourth gear. The gentle glide of the gleaming body as the car races down the narrow Newtown lanes. The glint of chrome, silver-grey. The dazzling headlights, the screaming siren, the soft gushing of air as the noiseless tyres hurtle on down the lanes. It's hardly ever the star, so, just for once, we'll make it the star and TELL YOU ALL ABOUT IT......"
A description of the four-door Ford saloon is given, the "crime car extraordinary" with its "hotted up" motor, breathed upon by "skilled police mechanics" enabling it to "roar easily to over a hundred miles an hour". The text drips with praise for the force's Zephyr Six - so much so that if Ford weren't supplying cars for gratis, they probably should have been. Photographs of two cars - or two different sets of numberplates - appear in this book, namely DOO 999 and DWC 59, each fitted with slightly different equipment to the other. A quiz, designed to test the memory and detective-like powers of the reader, draws this album to a close. Were Z-Car books published regularly throughout the series' run? I've come across references to a number of children's annuals, which also tend to feature a Ford Zephyr on their covers. Games and jigsaws were also produced. As more items turn up, I'll add them in. Return to the Motoring Collectables section to read about other items similar to this.